Original Atari ST Software. This is for use on Atari ST. Manufacturers part number This item is Used as in the photograph. Video format : PAL (UK Standard). You will receive what you can see in the photograph. 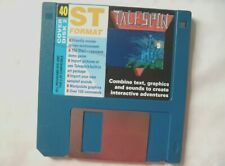 Disk 40 ST Format - Talespin. Cover Disk Only, Original Atari ST Software. This is for use on Atari ST. Video format : PAL (UK Standard). Manufacturers part number . Cover Disk Only, Original Atari ST Software. This is for use on Atari ST. Video format : PAL (UK Standard). Manufacturers part number . Cover Disk Only, Original Atari ST Software. This is for use on Atari ST. 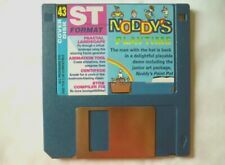 Disk 35 ST Format - Pacific Islands / Super Card 2. Video format : PAL (UK Standard). Look at the photo to see your genuine product. Disk 65 ST Format - Jetpac / Grafix. Cover Disk Only, Original Atari ST Software. This is for use on Atari ST. Video format : PAL (UK Standard). Manufacturers part number The listed product is original. Dizzy Prince Of The YorkFolk - Atari ST (1992). Condition is Very Good. Dispatched with Royal Mail 2nd Class. The Newzealand Story. Original Atari ST Software. This is for use on Atari ST. You will receive what is shown in the photo provided. This item is Used as in the photograph. Manufacturers part number . Box in very good condition for age. 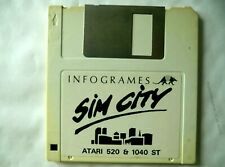 Includes box, instructions and floppy disk. Original Atari ST Software. This is for use on Atari ST. Manufacturers part number You will receive the product in the photo provided. This item is Used as in the photograph. ANTIC Complete Magazine Collection on Disk (88 Issues) 2 Disc Set Atari Resource. (XL/XE/400/800). COMMODORE USER Magazine Complete Collection on Disk ALL 78 ISSUES! YOUR COMMODORE Complete Magazine Collection on Disk (All Issues Specials) 2 DVDs. Disk 23 ST Format - 3D onstruction Kit / Rezrender. Cover Disk Only, Original Atari ST Software. This is for use on Atari ST. Video format : PAL (UK Standard). This product is sold as genuine. Manufacturers part number . Speedboat Assassins [NEW & SEALED]. This is for use on Atari ST. The genuine product shown will be dispatched. This item is New as in the photograph. Manufacturers part number . Original Atari ST Software. This is for use on Atari ST. First Samurai. This item is Used as in the photograph. Manufacturers part number . Original Atari ST Software. This is for use on Atari ST. Manufacturers part number This item is Used as in the photograph. Dizzy Collection. Original Atari ST Software. This is for use on Atari ST. This item is Used as in the photograph. Manufacturers part number . Retro Vintage Rare Bruce Willis Hudson Hawk Atari ST Ocean Software Baseball Cap. Condition is Very Good. Dispatched with Royal Mail 2nd Class. Original Atari ST Software. This is for use on Atari ST. Toyota Celica GT Rally. This item is Used as in the photograph. Manufacturers part number . Atari ST Review - Equinox Organiser. Cover Disk Only, Original Atari ST Software. This is for use on Atari ST. Manual included : No. Manufacturers part number . Disk 54 ST Format - Hyperpaint 2 / Spherical. Cover Disk Only, Original Atari ST Software. This is for use on Atari ST. Video format : PAL (UK Standard). Manufacturers part number You will receive the product in the photo provided. ST Format - Interphase. Cover Disk Only, Original Atari ST Software. This is for use on Atari ST. Manufacturers part number : January 1991. Video format : PAL (UK Standard). You will receive the product in the photo provided. This is for use on Atari ST. Cosmic Pirate. This item is Used as in the photograph. Manufacturers part number . Original Atari ST Software, Dust cover missing. This is for use on Atari ST. Lotus Turbo Challenge 2. This item is Used as in the photograph. Manufacturers part number . However, their roots date back to 1991, when DiD released F-29 Retaliator, one of the first attempts to model the F-22 and X-29 fighters. Great service. Collection not available for this item. Great price. Goldrunner II. Original Atari ST Software. This is for use on Atari ST. This item is Used as in the photograph. Manufacturers part number . Disk 74 ST Format - Turrican 2 / Mastersound 2. Cover Disk Only, Original Atari ST Software. This is for use on Atari ST. Video format : PAL (UK Standard). Manufacturers part number This is a genuine product. Untested as I no longer own an Atari ST.
Cover Disk Only, Original Atari ST Software. 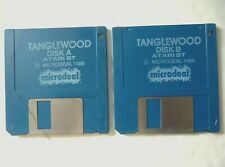 This is for use on Atari ST. Issue 07 Stampede ST Disk 2. Manufacturers part number You will receive what you can see in the photograph above. Boxed : No. Disk 75 ST Format - Realms Of Reality / Substation. New Cover Disk Only, Original Atari ST Software. This is for use on Atari ST. Video format : PAL (UK Standard). Manufacturers part number . Consisting of The Floppy Disks display well from the back. gaming fan. Final Fight's box is printed with '1989 TECMO LTD.' on the back. Impossamole for the Atari ST developed by Core Design & published by Gremlin Graphics in 1990. Condition Score. • Original box. Atari U.K. Language Disk. Original Atari ST Software. This is for use on Atari ST. This item is Used as in the photograph. Manufacturers part number . Cover Disk Only, Original Atari ST Software. This is for use on Atari ST. Manufacturers part number : Disk 1 Issue 30. Look at the photo to see your genuine product. This item is Used as in the photograph. Retro Vintage Rare Bruce Willis Hudson Hawk Atari ST By Ocean Software . Condition is Very Good. Dispatched with Royal Mail 2nd Class. RARE Atari ST. Sleeping Gods Lie.